Chicago, Ill. – April 16, 2018 — LifeNet Health’s HuBiogel microtumor system —­­ the only 3D fully-human tissue-like bioassay platform — provides investigators a vital tool for accelerating preclinical research and drug development. This cell-culture technology is an in vitro biology platform that replicates how cancer cells react to drug treatments in vivo. Unlike common 2D systems, 3D human tumor models enable precise, biologically accurate analysis of multiple endpoints crucial for preclinical and translational oncology programs. 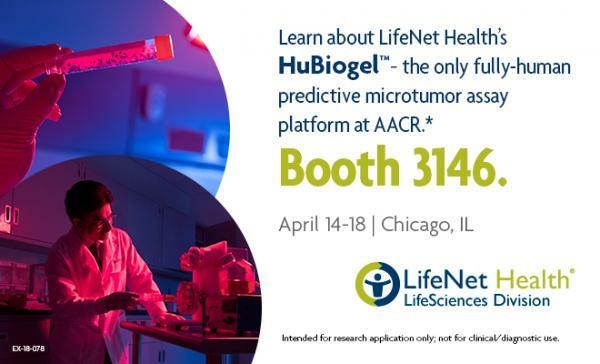 LifeNet Health’s LifeSciences Division will feature its HuBiogel microtumor assay systems which are suitable for high-throughput screening of multiple classes of agents and biologicals, at the annual American Association for Cancer Research (AACR) meeting in Chicago (Booth 3146). HuBiogel replicates the multicellular biology and microenvironment found in vivo, allowing the creation of fully-human microtumors with high correlation in functional, genomic and kinomic profiles with results from NCI-60 and PDx models. Its unique compositional and biological properties allow for proper 3D cell-cell and cell-matrix interactions and enable gene and biomarker expression as found in the human body. LifeNet Health’s LifeSciences Division offers human tissue and cell-based in vitro biology platforms by leveraging its innovative, technology-driven transplantation and preclinical research programs. The LifeSciences Division vertically integrated human tissue recovery and cell preparation supports the increasing demands for human biospecimens, primary cells and hepatocytes for scientific research, drug discovery and safety testing. The application of three dimensional matrices and human cellular models will enable significant scientific improvements for more relevant biologic experiments. LifeNet Health helps save lives, restore health, and give hope to thousands each year. It is the world's most trusted provider of transplant solutions — from organ procurement to bio-implants and cellular therapies — and a leader in regenerative medicine, while always honoring the donors and healthcare professionals who enable healing. For more information about LifeNet Health, go to www.lifenethealth.org.